In the competitive market of smartphones where a new handset is launched every second day, it would not be strange if Blu Vivo XL2 takes the market by storm. This handset has the specifications of a mid-higher range handset. However, the price at which it is offered is absolutely phenomenal. This American smartphone maker is quite popular for its affordable range of handsets. And if you're looking to purchase a mid-ranger, then Vivo XL2 might be that handset. Which is why we have to dive into Blu Vivo XL2 specifications detail to know more about it. - The best part is it has a protective cover of Corning Gorilla Glass 3. - A non-removable Li-Po 3150 mAh battery. One of the disadvantages of this type of battery is that it becomes an expensive affair to change the battery should the need arise. - According to one of the users, inserting the SD card can be quite tricky. Moreover, it seems that no clear cut instructions on how to go about it are provided. - Another concern some of the users had faced is, that, the SD card, after being inserted into the mobile, does not get formatted on its own like most other Android handsets. - The performance of the handset might take a back seat because of its Quad-core Processor, which might slow down the performance of the heavy duty specification the handset, is laden with. Boots on Android 6.0 Marshmallow OS and has a Quad-core Processor. Other specifications are: Chipset MediaTek MT6735, Frequency 1.5GHz, GPU or graphics processing unit is Mali T720. Mali T720 is the primary contribution in the Cost-Efficient GPU series which has its genesis in the Midgard Architecture. It is exceptionally area-efficient. It boasts of a Primary Camera of 13 Mega Pixel and an excellent 8 MegaPixel Selfie Camera. Other features it possesses are Video Recording facility, Geo-Tagging, Autofocus and a LED Flash. Blu Vivo XL2 offers an enthralling experience with a screen resolution of 1280 x 720 pixels. The handset comes with a 5.5 inches ~70.7% screen-to-body ratio Display Size and TFT Display Type. It has a captivating Capacitive Touch Screen with Pixel Density of 267 ppi. It is also loaded with Multi-touch Display Feature. The screen has an added protection of Corning Gorilla Glass 3. The Dimensions of the mobile handset:154 x 76.6 x 9.2 mm (6.06 x 3.02 x 0.36 in) and weighs 175 g (6.17 oz). It has Dual Micro-SIMs. The handset has Internal Memory of 32GB. One of the chief attractions is its 3GB RAM. 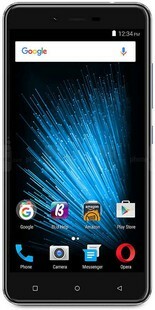 The handset is equipped with an expandable MicroSD Card Slot up to 64 GB. The mobile has a Li-Ion 3150 mAh non-removable battery which makes it difficult to tamper with the battery and cause lesser damage to the interior of the handset. The non-removable battery of this handset has a standby up to 750 h (2G) and up to 650 h (3G) and has a battery life for a healthy talk time of 29 h (2G) and up to19 h (3G). Why should I buy Blu Vivo XL2 release in India? With such specification as Accelerometer Proximity Sensors, other loaded features, and an extremely good look the Blu Vivo XL2 is an amazing value for money at an expected price of Rs. 12,990/-. Time alone will prove its worth though. Blu Vivo XL2 full specs and reviews as of Apr 2019. Buy it here!